Therefore, I give you this best diaper pail buying guide to help you out! If you are a first time parent, selecting the best diaper pail can be tricky for you. So before we proceed with our best diaper pail list, here's a few things you can consider. The volume of diapers per day should match the pail's capacity The number one thing I look for in a diaper pail is capacity. Of course, I don't want to take out the trash bag every few days, so a diaper pail's capacity can greatly increase convenience. When looking for a new diaper pail, you also have to consider the age of the child because the size of his/her diaper will matter when estimating capacity. If you have a newborn, I suggest buying a big capacity diaper pail so you can use it for later years. On the other hand, if you are purchasing a new one for your 2-year-old, look for a pail that will fit a lot of XL diapers for convenience. You also have to consider getting bigger capacity diaper pails if you have multiple babies (twins, triplets, etc.) because more babies mean more dirty diapers! However, a bigger capacity diaper pail can also mean longer storage time of dirty diapers. If you have a single baby or don't dispose of diapers that often, choose an adequately sized diaper pail that you can change regularly. In this way, you don't store the diapers for too long and prevent the bacteria from spreading inside the bin. TIP: A diaper pail with a big frame doesn't always mean that it has a big capacity, make sure to check the inside if it can hold a big size trash bag. 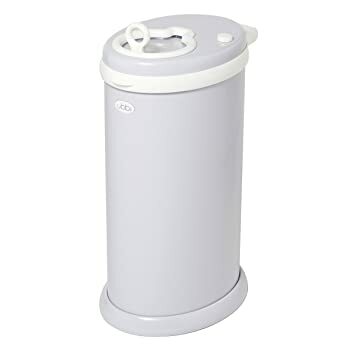 A diaper pail should also prevent odor from spreading around the room Another important factor is a diaper pail's capacity to lock in odors because you definitely don't want your child's nursery to smell like baby poop all the time. A high-quality pail will have a good airtight odor locking technology that will keep the room smelling fresh all the time. As a personal tip, I suggest investing in a higher-quality product (albeit more expensive) in order to get a diaper pail that can seal in odors for a few year's use. If you can, a great way to reduce odor in the pail is to flush down the solid waste down the toilet before dropping it into your diaper pail. Also, remember that diaper pails don't eliminate odors, only lock them inside when closed. So, if you open up a diaper pail to dispose of another dirty diaper, expect a little odor to escape. However, it should disappear upon closing. However, some diaper pails have special odor locking technology that extends up to its opening mechanism. Some have systems that close up the trash bag inside upon closing of the lid, while some have a separate lid that will separate the outer lid from the trash bag. These type of diaper pails can be expensive, but they can be a great investment for parents. Moreover, if a pail can lock in odors, it should also have a childproof safety lock. I recommend looking for a pail that has a sufficient locking technology to keep curious hands away from bacteria. Using of foot lever pails will let you go hands-free Changing overnight diapers while half asleep can be a difficult job, and you definitely don't want to bend over and lift the lid just to dispose of a diaper. Most diaper pails have a step-on mechanism to open the lid, but some require pushing down a lever. In any case, select the best diaper pail that you find easiest to use. Moreover, find one that has a high-quality mechanism that won't break over time. 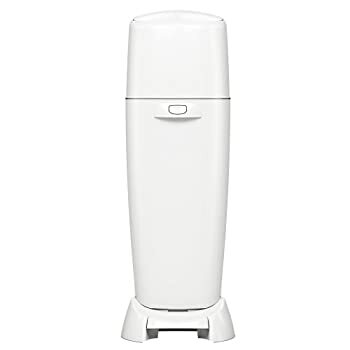 Playtex has released a new design for their diaper pail line, and it looks much sleeker and modern than the previous ones. This pail comes with an ergonomic design and built in carbon filter that will make diaper changing easier and your room smelling fresh. This model was made to fit a lot of diapers (even adult diapers!) so when it comes to capacity, I definitely don't have a problem with this product. Thus, I recommend this diaper pail to all parents with babies who go through a lot of diapers a week. Even though this diaper pail can let odors escape when the lid is open, it still has efficient odor control when closed due to its carbon filter. However, this pail has some flaws, too. If you are going to add in dirty diapers, a smell will waft upwards but will disappear after closing. This is a minor problem that can be solved by wrapping up dirty diapers well. 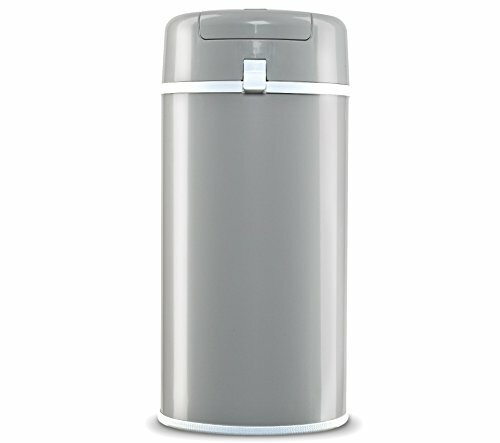 Another great product on this list is a stainless steel diaper pail from Ubbi. 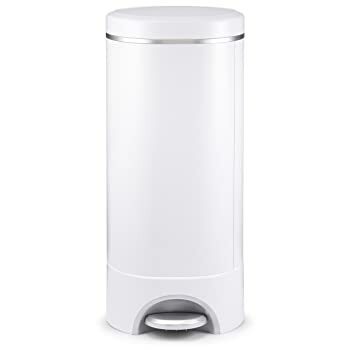 This high quality diaper pail can lock odors in, holds bags without ripping upon removal, and does not require a special bag. This diaper pail is of a size that can hold a lot of diapers, which is a great thing for parents with multiple babies. The opening mechanism of this diaper pail plus its quality rubber seals keep your baby's room smelling diaper-free at all times. You will definitely not smell anything when it's closed. One unique feature of this diaper pail is its opening mechanism. Unlike other pails which have foot-levers to open the lid, you have to open a special push-in lid to drop in your dirty diaper. This can be less convenient, but it is a good child-proofing way. One major con of this diaper pail is that it doesn't have a childproof lock for the pail itself, so a curious toddler can open the mechanism easily. This product from Munchkin is an innovative pail that comes with a self-sealing system. This is the diaper pail I recommend for parents who want to go hands-free, and have the easiest option for closing and disposing of their bags. One con to this excellent pail is its capacity, because you can't expect it to hold a lot. However, pros outweigh the cons so I still recommend this diaper pail to parents with single babies. This product by far has the best odor locking technology. When you close the lid, a self-sealing mechanism will also seal the bag and prevent unwanted odors from wafting upwards. If you want to smell minimal bad odors, this is the diaper pail I recommend for you. A foot lever on this diaper pail can help you change and dispose of diapers easily. Because your hands are full, this diaper pail will let you dispose of dirty diapers in one easy motion. This diaper pail isn't perfect, though, because of its capacity. The size to capacity ratio is slightly off, because it won't fit a lot of diapers as expected. If you're looking for capacity for your twins or triplets, this diaper pail is the one for you. The Diaper Champ is the whole package for less; holds up to 30 diapers, superior odor control, and easy to use opening mechanism. A great pro to this diaper pail is that it can hold up to 30 diapers, and you can use 13 gallon trash bag for this. So, I highly recommend this one for multiple babies and for larger diapers. When it comes to odor control, this diaper pail does its job well. However, a smell can develop over time. There's no complaint here. 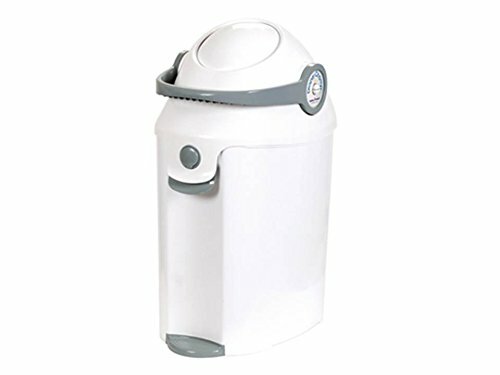 This diaper pail from Baby Trend has a foot lever mechanism that allows you to dispose of your diapers quickly and easily. One flaw to this diaper pail is that after time, it will develop a smell if you're not careful enough. Looking for a higher-quality product? The Bubula steel diaper pail answers to all of these: capacity, odor control, ease of use, child-lock, and design. As an all-in one product, I recommend this for parents who want to use only one diaper pail for a long time and for multiple children. If you're looking for a larger container to hold a lot of diapers at one time, this product is the one for you. However, be careful not to overfill it; it can be quite difficult to take out the bag then. With its airtight lid and special disposal mechanism, this product will not let foul odors out, even while disposing a freshly changed diaper. Not a good option if you want a foot lever system. This diaper pail uses a push-down mechanism to open the lid. A minor con, in general. However, the lid is not as durable as we want it to be, and can break if you're not careful enough. There are a lot of great diaper pails in the market today, but as always, we have to choose only one top pick for this list. The Munchkin Step Diaper Pail Powered by Arm & Hammer takes the cake for me. It's the best option from this list because it answers to all our factors sufficiently, including capacity, odor control, ease of use, and even design. Moreover, the one thing I really love about this diaper pail is its self-sealing system. Odor-free nurseries guaranteed! On the other hand, The Baby Trend Diaper Champ Deluxe is the most economical, thus the best value product of this list. It's a good enough diaper pail for me, with a big capacity, adequate odor control technology, and easy to use opening mechanism for disposal. Well, that's it for this article. If you liked this one, make sure to leave a comment below and share this with your friends. Lana is a full-time mom of three. She juggles work, motherhood, and blogging with the grace you could compare to a queen. Lana specializes in child care, chore tricks, and everything you'd need to know on taking care of babies.